Located on Osoyoos Lake, Casa Del Mila Oro Resort with its santa fe styled design is perfectly located for your Osoyoos vacation. This family friendly resort has a beautiful waterfront, as well as a pool and hottub and is located steps a way from Rattlesnake Canyon Amusement Park. A short drive away the South Okanagan wineries await your visit (Nk'Mip Cellars, Burrowing Owl as well as the numerous wineries on the renowned Golden Mile). The area's golf courses include the 36 hole Osoyoos Golf and Country Club as well as Fairview Mountain (has been rated in the top 100 courses in Canada). This spacious 3 bedroom, 2.5 bathroom 1600 square foot townhouse is newly decorated and has a fully equipped kitchen. The master bedroom has an ensuite, king sized bed and flat screen tv as well as outdoor deck with a beautiful lake view, the second bedroom over looking the pool has a queen sized bed and flatscreen tv and the third bedroom a double bunk with single above. The fully equipped kitchen has steel stainless appliances and granite countertops, the living room includes a pullout couch and 60 inch flat screen tv. The outside patio has a great view of the lake and has a generous sized bbq and patio furniture. The townhouse also has a single garage and washer and dryer. I grew up on a farm in Langley, BC., and currently live in Abbotsford. Growing up my family's vacations always included a week in the South Okanagan, so the area is special to me. I am thrilled to own a vacation home in Casa Del Mila Oro. Specifically, I enjoy the views of Osoyoos Lake as well as the feel of the town of Osoyoos. Having grown up on a farm, I especially appreciate the beauty of the area's orchards and vineyards. Of course all the golf courses and the beach make my trips complete! Geothermal system, cools without the noise of an air conditioner. Perfect location and spacious accommodations for our ladies group! This property is perfectly located across the street from a beach which is private for the residents of this complex! The townhouse itself has very spacious living accommodations for a group of 8. The owner is easy to deal with and accommodating. The cleaning staff are extremely friendly and thorough. The decor is adequate and the kitchen is fairly stocked with the exception of some basics like salt and pepper, tin foil etc so bring your own! Decent spot, great location looking onto the lake. Nice place but could use a little TLC. Carpets need to be shampooed and some paint touch ups are needed. The pool was nice to have since it was pretty hot the one day with no wind. Overall it was clean and well kept. Large open spacious room for family of 8. Had a wonderful time at the townhome. Spacious downstairs family area with large kitchen area. Bedrooms were open, large windows in two bedrooms. Deck off main bedroom was dusty and could have used a sweep/wash. Family enjoyed the stay looking forward to going back and staying there again. I spent a month here and loved the views from the patio and balcony.The rental was clean and comfortable and had everything I needed.Thanks Wes. Beautiful place to stay, the inside was very clean and well kept. We loved how close the lake was and also having the hot tub to relax in. We loved being walking distance to the lake and the swimming pool. Having a private beach was great! The home was clean and spacious. We will definitely be booking here again! 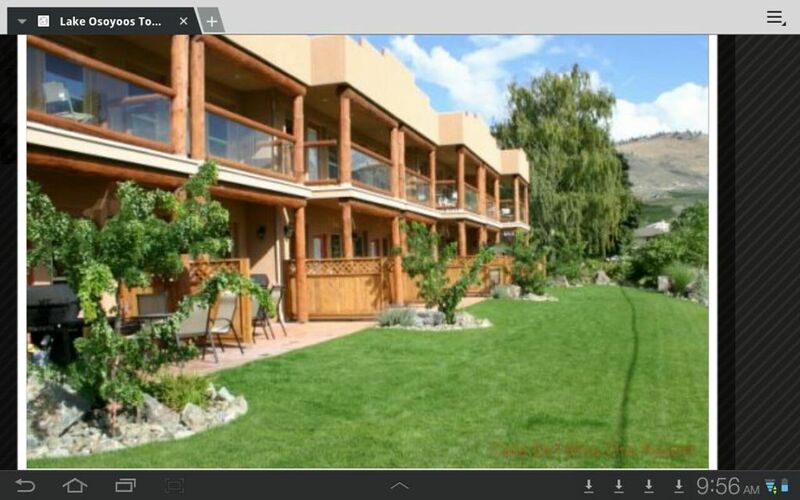 Great location to enjoy Osoyoos and the South Okanagan. Adults will enjoy exploring local wineries (Nk'mip, Burrowing Owl, Tinhorn Creek etc), golfing (Osoyoos Golf and Country Club, Sonora Ridge, Fairview Mountain) or just relaxing on our beach or poolside. The kids will enjoy Rattlesnake Canyon Amusement Park a short walk away or enjoy time making new friends at our pool or on the beach.